Throughout the month of June, Pride month, I have been helping Adam write blog posts about Cuddlist’s impact on the LGBTQ+ community, along with seeing blog posts from other Cuddlists about their experiences working with LGBTQ+ clients. Even though I am just an intern, Cuddlist has given me my own platform to use my voice. 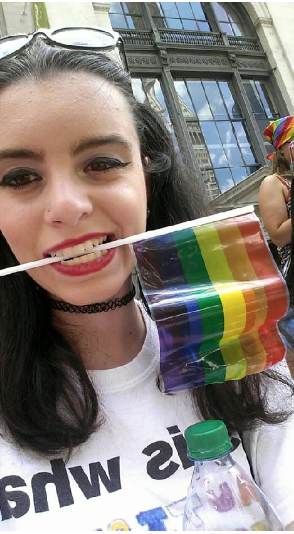 As a pansexual woman, I always felt invisible when discussing issues on LGBTQ+ rights. To me, being pansexual means an attraction to someone regardless of gender identity. This meant I could be attracted to someone of the opposite gender as well. Throughout the first several weeks of interning at Cuddlist, I not only met so many people with different sexual orientations and gender identities via marketing and practitioner calls, I also learned about many LGBTQ+-identifying Cuddlists and clients through previous blogs and news stories. The news story that stuck with me the most was the interview Chris had with his client, Cuddlist released last April. It shows Cuddlist creating a safe haven for the LGBTQ+ community and making an impact on the lives of those in the community. Learning about how Cuddlist has impacted many LGBTQ+ practitioners and clients has made me realize how one session with Cuddlist could make someone feel more empowered and listened to. It has also made me realize how empowering it could feel to listen to others’ stories and learn from them.